Clean, nice staff, nice common area to meet others. Basic, but good! Only complaint is WiFi doesn’t work well in the rooms. But great facilities, free lockers, good place to meet people, and cleaner than I expected based on reviews! There wasn’t much choice for hostels in Santorini, however I’m so glad I chose this over some hotel! I was doing a solo trip through Greece this week and Fira Backpacker Hostel was a great choice, close to the bus station, lots of places to eat and shop, and a gorgeous view of the caldera all within 5 min walk. Fira is the main bus station on the island so it was nice to have direct bus lines to other towns. Highly recommend! 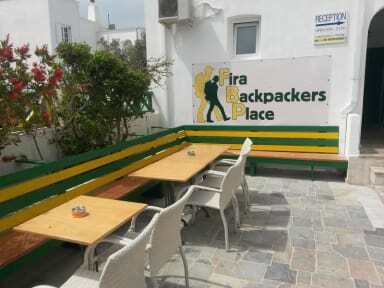 This hostel is in the perfect location it is in the center of Fira and you are a 3 min walk to the bus area. The atmosphere was great and it was super easy to meet people! Definitely recommend! Very nice hostel!! 24 hour reception check-in & super nice facilities including semi-private bathrooms, a common area, a kitchen, & a pool! Plus the water in the shower got super hot, which was nice! Good location: close to the airport & the main bus station. & the hostel provided towels & padlocks! Plus, were outlets & lamps at every bed. Definitely recommend! Nice hostel, great location in Central fira around the corner from the bus stop which is very convenient. Towels provided, kitchen for your use, as well as locks free of charge, and the hot water works. In a hostel, what more can you ask for. The staff was really fantastic they were incredibly helpful. They were super knowledgable and helped us in getting around and finding local restaurants. However, it was not very clean and the rooms were incredibly dark also the mattresses were pretty uncomfortable.